Writing from sources doesn't happen overnight. Students need support, modeling, and scaffolding as they learn how to gather information, connect ideas, and synthesize new products. In this second part of the presentation, several different low-stakes activities are suggested. Like lead-up games in physical education class, these activities help students to develop the underlying skills for strong synthesis. These activities also happen to be highly engaging for students, and they strengthen and develop critical thinking skills. Which activities do you think would work in your classroom? What other activities have you tried to help students learn how to synthesize ideas? On Tuesday I had the privilege of presenting a workshop about synthesis and writing from sources for my colleagues. We gathered around tiny kindergarten tables in the quiet school to share stories, information, and ideas. What fun! I've been intrigued by the role of synthesis in student learning for a long time. How do we synthesize? How can we help students bridge ideas between topics and texts? Not only is synthesis required for writing from sources, but it is also the whole point of what we are doing in the classroom. Students will take the pieces of what we give them and what they gather to create something entirely new. -Which of the skills of connecting, organizing, and selecting do you see as most difficult for your students? -How does this help you to plan for successful writing from sources? In the next part, I'll share some low-stakes classroom activities to build up these key skills. These engaging activities help to build a culture of synthesis in the classroom--and will make the task of writing from sources much more friendly for students. -If you're looking for an easy-to-implement writing from sources task, try this Under the Sea nonfiction text set. A synthesis task is included. Introduction to Text Structure could also be used for writing from sources tasks. -September Reading Homework is revised and ready for the new school year! -Daily Sentence Writing 1 and Daily Sentence Writing 2 are both complete. These are materials for the workshop presented on June 17, 2014. If you are interested in the folder of items on Google Drive, simply email me from your Gmail account. Kindergarten writing from sources: How do you say hello? These are resources presented in a June 17 workshop. What are the "codes" that you must use to navigate these websites? Working with summer school this summer? I remember the days of wanting to plan high-interest, engaging activities...but not wanting to spend all day creating new materials. Here are some resources that I have created that might save you time and get you back by the pool! This intervention includes six high-interest nonfiction texts with summer themes, all written at a 4-5 grade reading level. You could use the entire 30-day program, or just use some parts. 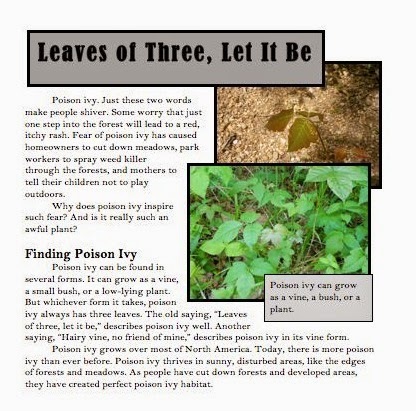 My students have always enjoyed reading "Leaves of Three, Let It Be" and then walking around the schoolyard to look at (but not touch) poison ivy! Other texts include caverns, thunderstorms, and bluebirds, all of which lend themselves to fun outdoor extensions. My students loved the recipe for s'mores that I wrote for this series of texts. It would be fun to compare and contrast the classic s'mores with the indoor s'more recipe! Also included is a fable, a problem/solution text about cheetahs, and a readers theatre selection about Memorial Day. Each text includes vocabulary, comprehension questions, an extension focusing on complex text, and an open-ended response. Readers theatre scripts are a great way to engage students in practicing fluency. They are happy to do repeated reading when they get to perform! These scripts are funny little plays that introduce students to aspects of Roman culture. You could do multiple scripts with a large group, or have the same group of students do several scripts over a period of days or weeks. Students can then compare the information in the readers theatre scripts to the information in the included article. Four texts with comprehension questions and open-ended responses. I wrote these when my students were fascinated by octopuses. (Yes, it's octopuses and not octopi!) I became fascinated too! The culminating activity included with these texts would be lots of fun for summer school and could lead right into an aquarium visit. If you have access to iPads, check out Frolyc.com. You can create activities and publish them to student iPads, have students create activities, or use activities that other teachers have created. (Search my name to find some of my activities.) This is a great time to play around with a great tool for the upcoming school year. -I am working on Part 2 of the Daily Sentence Writing. By the time I am finished, there will be more than 20 weeks of sentence activities to help students compose, imitate, and chunk sentences. -Other plans for the summer include updating the Visualizing activities, adding a new unit on analyzing stories, and finishing a reading intervention that incorporates United States geography. Leave a comment if you would like something to be a priority! -Kids bring in books that they have already read. They bring them to the designated place and receive a ticket for each book. -On the day of the book swap, teachers and students spread out the books on tables. This could be done lovingly and with great care (if you have extra time in the last week of school--ha ha!) or hastily (my preferred method). -Kids with tickets come and get first pick of "new" books to read for the summer. -Everyone else can come and pick out a book. Now, it might sound as if only the kids who donate books get to pick new ones. But it never works out that way. We always have such an abundance of donated books that every kid gets to choose at least one. Usually we end up giving away tons of extras! Why does this happen? There are always parents who take advantage of the book swap to do some spring cleaning, donating 20+ books. The kids with this many tickets freely give away tickets to friends. Teachers (including me!) also take advantage of the chance to clear the bookshelves a bit. I make sure that any tickets I get find their way into the hands of students. Even with this giving away of tickets we always end up with extra books. It is a great and wonderful mystery of life. One parent note home and repeated announcements are usually enough to ensure participation. In fact, I've been surprised at how many students join in. Every student in my school received two free books from RIF (Reading Is Fundamental) this year, and many of these books are brought in. It's neat to see how RIF books can bring reading to multiple kids. A book swap is a free way to promote summer reading, and it is a nice activity to get kids reading in the last week of school. Have you tried a book swap? Share any tips or stories that you have!